A unique project is making strides in breaking down community resistance toward international efforts to contain the spread of the deadly Ebola virus in the eastern Democratic Republic of Congo. The International Federation of Red Cross and Red Crescent Societies (IFRC) has teamed up with the U.S.-based Centers for Disease Control (CDC) to collect, analyze and implement new strategies in "real time" to tackle the major concerns of people faced with this dreaded disease. Latest World Health Organization figures put the number of Ebola cases at 829, including 521 deaths. Officials say containing the spread of this deadly virus will depend largely upon getting communities to cooperate with health care workers. This involves gaining their trust by overcoming the fears and misinformation that exist in Ebola-affected communities. Red Cross volunteers mainly come from the communities in which they work and understand their cultures and traditions. Health workers say getting feedback on Ebola from communities in conflict-ridden North Kivu and Ituri provinces is critical in tackling this crisis. IFRC Community Engagement Senior Advisor, Ombretta Baggio, says information gathered from surveys is problematic. So, she told VOA Red Cross volunteers no longer prompt people to answer a list of survey questions. Now, she said, they listen. "We have conversations with them around their concerns, around Ebola. What they want to know from us around Ebola. So, the questions they have, the belief systems that they have, the rumors that they are listening in their communities. And, during these conversations, the volunteers share information around issues that are of concern for the communities." Baggio said the Red Cross has just finished an analysis of the data collected from Beni, where the Ebola outbreak was first detected in August. By listening, she said Red Cross volunteers have learned about the fears and concerns people have about the treatment centers where infected people are isolated from their families. Health workers treat an unconfirmed Ebola patient, inside a MSF (Doctors Without Borders) supported Ebola Treatment Centre (ETC) in Butembo, DRC, Nov. 3, 2018. After the data is coded and categorized, she said it is shared with the Centers for Disease Control. "CDC does the quality assurance of the data…and they interpret this data in a way that is user friendly for the response partners…This analysis helps our volunteers understand what are the most prominent questions that in that space of time communities are asking," said Baggio. 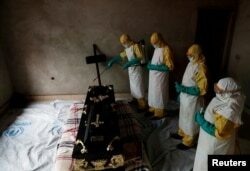 Traditional burial practices play a key role in the spread of Ebola. Christine Prue, a health scientist with the CDC leads the project. She said providing safe and dignified burial services is one of the major pillars and interventions in reducing the spread of the disease. "So, we analyzed all that data and sent the reports back to Red Cross in saying is there a way for family members, a safe way for family members to be involved. Their teams on the ground figure it out…So, our analysis of the information they provided and our questions saying can you do things differently to bury them in a way that could include family members was totally their action on our information…So, they have changed their practices to allow community members to participate in a safe way," she said. 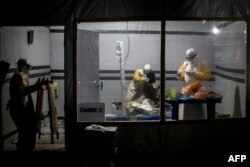 A healthcare worker sprays a room during a funeral of Kavugho Cindi Dorcas who is suspected of dying of Ebola in Beni, North Kivu Province of Democratic Republic of Congo, Dec. 9, 2018. Prue said there has been a shift in peoples' confidence around burials. But as one problem is solved, she tells VOA others arise. She said the Red Cross will have to adapt its programs to meet these different needs. "I do think in general that the pattern they have set is very good. But I do not think we can ever be satisfied that one way is going to be the only way, which actually reinforces the need for these kinds of feedback systems because every community is going to experience threat. Every community is going either invite, involve people, outsiders, insiders in different ways," said Prue. The World Health Organization cites Katwa and Butembo as the remaining major health zones of concern. It says community mistrust, especially in Katwa is high. Consequently, it says people are reluctant to report suspected cases and bring infected people in for early treatment. Red Cross Advisor, Baggio said an additional problem is health workers are unable to access several areas in Katwa because of the conflict. However, she said the lessons learned from the project's analysis will be implemented in areas where they can work. She said volunteers will no longer deal with Ebola in a general way. Instead, she says they will focus on and respond to the precise concerns articulated by the communities in Katwa.